Translation is an ambient time-based work of digital poetry by John Cayley with generative music by Giles Perring (first published in 2004, pictured below). A black screen is gradually replaced by fragments of images of paper pages containing passages from Walter Benjamin’s essay, On Language as Such and on the Language of Man. These passages undergo an iterative algorithmic translation process, moving between computational, visual and textual realms, blurring boundaries between English, French, and German. The translation process is never finished, never fixed. There are currently four separate versions of Translation. Full descriptions and download instructions for each are available on John Cayley’s website. Genesis is an interactive installation by Brazilian biotech poet Eduardo Kac (first exhibited at Ars Electronica in 1999). A sentence from an English translation of the biblical book of Genesis is translated into Morse code and then converted into genetic code. Much of what has been written about this well-known work has focused on the fascinating process by which a synthetic "artist's gene", written by the chemical base pairs that make up the DNA molecule mutates under viewer-activated ultraviolet light thereby creating a new translation of the biblical text. Less attention has been paid to the choice of Morse as an encoding language in this piece. The switch controlling the ultraviolet lights in Kac’s installation echoes the on-off states of telegraph transmission. Morse code has a similar binary logic to digital 0s and 1s, but Morse can be read by humans without a decoding device. Telegraph operators translated audible clicks into hand-written dots and dashes. Wireless operators translated the dit-dah sounds of short and long pulses directly into their phonemic, alphabetic equivalencies at speeds so great as to preclude them from being able to read as they wrote. In performing this act of translation their bodies became hybrid creatures, part medium, part scribe; human interfaces, closing the circuit between transmission and reception, signal and static, ear and hand, transcription and meaning. The physical body is re-inserted into the translation process in on translation, a recent work by Vienna-based new media artist Michael Kargl. Two triple language systems are operating in this work: a translation of a text from German to ASCII to binary, and a translation of this act of translation from a live performance, to a computer program, to an installation art work. During the live performance Kargl began writing a computer program that would translate a passage from Walter Benjamin’s essay The task of the Translator from ASCII-code to binary-code, and then back again. The encoding of the transcription from one sign system to the other, from one language to another, is interrupted by the free will and interpretation embodied in the person of the translator. 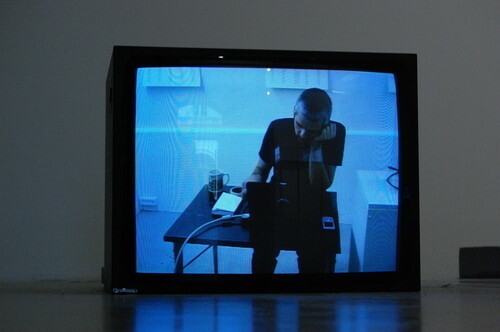 Throughout the performance, Kargl – the translator, the programmer and the artist – sat hunched intently in a chair at a table over a computer < body class="artist" id="performance" style="position:absolute” > The video-documentation of this portion of on translation is itself a translation. It shows the first step: translating the idea of the translation into a code that could then perform this translation. Once this step is done, it doesn't need to be repeated. The program takes over the process of translation. The installation is a physical manifestation of the program at work. The video translation of the live performance is shown in connection with a machine within which the program written during the performance is live-translating the text from Walter Benjamin.